Scooters are a basic member of any suburban community. You can see it around neighborhoods, TV shows, and communities being used by kids but sometimes adults as well. It is characterized by a baseboard where you stand, a tube with handlebars for control, and a kicking mechanism that is how it is operated. Scooters are convenient and super easy, which makes them ideal for young kids who are just starting out to ride. You do not need special skills, or a lot of practice like you do when riding a bike, which makes it the ideal starting vehicle for little ones. A special type of scooter is the dirt scooter. 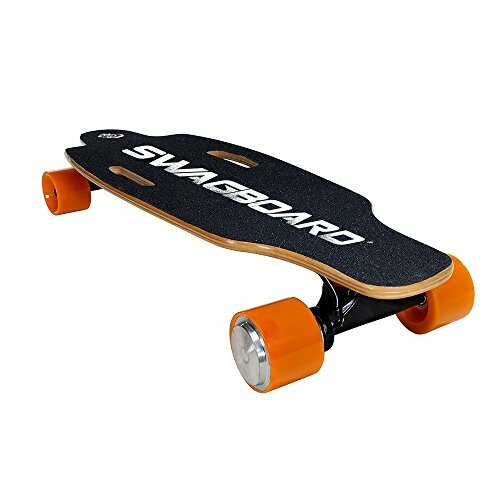 If you have ever been in a dirt path or rough terrain with a regular scooter, you might have had the problem of getting rocks blocking the wheels or grazing the underside of the board. This is not a problem with dirt scooters since they are specially designed to tackle these kinds of paths –the rough, uneven, and obstacle-ridden paths that are usually off-road. Perhaps the most popular manufacturer of dirt scooters, Razor tends to lead the pack. Like the true dirt scooter that it is, the Razor Pro does not restrict you to pavement driving. It is made with the best quality and heavy-duty material that you or your kids will definitely enjoy on and off course. Everyday school rides will be a thrilling adventure with the Razor Pro. It comes fully equipped with that real dirt riding experience. Judging by the specs alone, there are a number of benefits you get from the Razor Pro. It truly lives up to its name with professional features such as the quality grade of the material used to make the frame itself. The aircraft grade aluminum is sure to resist all the rough and tumble that your dirt scooter is bound to face when driving beyond the paved areas. Apart from that, it also comes fully equipped with a full deck of coarse grip tape to keep you from slipping even through the roughest terrain. It also comes with a classic and trusty rear fender brake that you can count on for those steep inclines. The wheels are made of touch-molded nylon with an aggressive tread pattern that is specially made to tackle rough and unpaved paths. Not only is the Razor Pro made with materials that can withstand rough riding, but it is also constructed in such a manner that matches the durability of its material. It has a fixed riser Y-style handlebar that is coated with soft rubber grips for comfort and stability, and it has a tubular BMX style steel fork complete with triple stacked head-tube clamp. The Razor pro is built to cater to a wide range of riders as young as ten years old. However, since it is built to cater to riders as young as that, it may turn out to be too small for larger or taller adults –especially if you are over six feet tall and/or over 220 pounds heavy. You might just get an awkward ride if you are too big for it. Also, I have tested it out a couple of times, and it seems to be harder to maneuver in grassy areas for some reason. If you have been thinking about giving your grade-schooler a cool ride for school and play, you may want to consider getting him or her something that is easy to drive, and sturdy enough to withstand rough riding. Nothing can be better and simpler than a good old dirt scooter. It is easy to operate and can be ridden in almost any form of terrain –paved or not. Just make sure to choose one like this Pulse Performance DX1 that comes packed with features. The freestyle dirt scooter from pulse performance is super easy to operate. You kid will definitely get the hang of it in no time at all. It does not require any batteries or fuel to operate. All it needs is a bit of leg power and it is good to go. Its over sized pneumatic tires are especially built to withstand rough and unpaved surfaces, to easily absorb shock, and to glide over obstacles very easily. It is made with high quality durable material that can withstand rough use and rough terrain. The over sized tires are pneumatic or filled with air, meaning that they are more shock absorbent and can more easily glide over rough terrain. 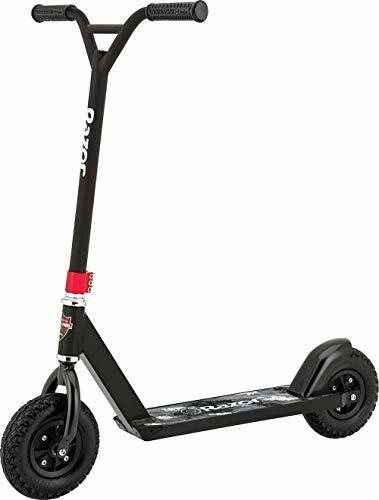 This is the perfect dirt scooter if you have an unpaved path or if your kid likes to take the rough road during play with their friends. It comes equipped with polished stainless steel rear foot brake that is powerful enough to make easy and quick stops when needed. This is paired with BMX-like handle grips that are made for comfort and convenience. It also allows you to grip it securely so that you can avoid slips and falls, and also maintain full control of your dirt scooter at all times. There is some amount of assembly needed for this unit. In fact, it comes with a number of bags for bolts and spacers so it could be confusing if you get them mixed up and you might end up with a very imbalanced scooter and a disappointed kid. Also, the tires do not come inflated as the package arrives. You will have to inflate them yourselves so make sure you have the right tools for this as well since it can be quite difficult to attach flat tires to the unit. Made by and for professional riders, Phase Two takes dirt scooter riding to a completely new level. In fact, it took years of testing and development to make sure that the pro product is truly of pro quality. It is not only made with the best quality material but more than that, it is made with excellent design and craftsmanship that makes it truly functional and at the same time truly stylish and sleek. 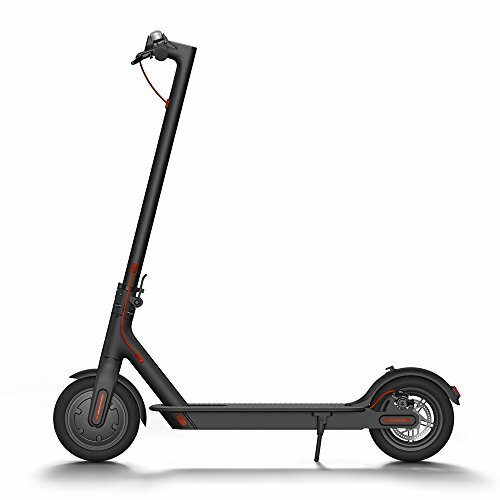 The design is perfectly fit for adults who are into professional dirt scooter riding, or for cool kids who want nothing less stylish than the ultra-sleek design that Phase Two brings. If you are something that has the thumbs-up of pros, you had better check the Phase Two out. 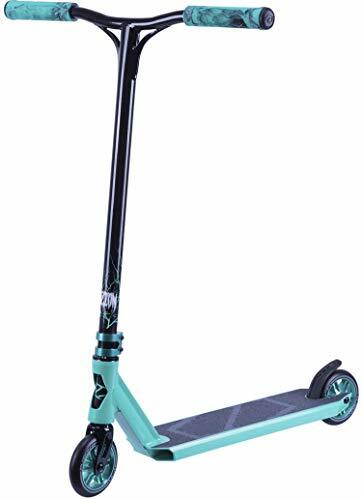 It has been design, developed, and tested by professional rider John Radtke himself, so you can be assured that this pro scooter performs just as a pro scooter should. Since it is made by and for pro riders, you can expect a more sleek and stylish design that is less for kids and more for serious riders out there. 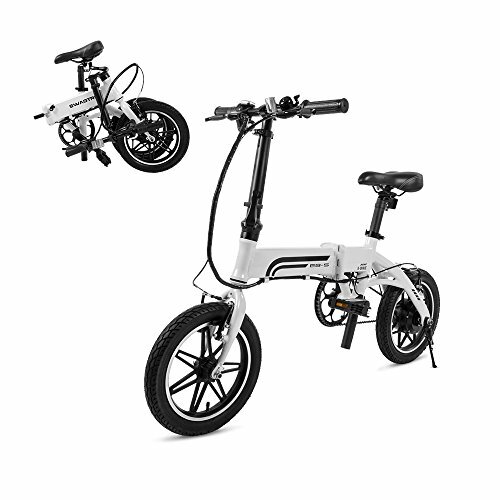 On top of that, the stylish design is backed by functionality since it is really built for riding whether in parks, in streets, or even in unpaved paths and obstacles courses. The extruded aluminum X deck is built with a larger footprint for a much stronger bond. The high-pressure tires give you are steadier and more resistant base to withstand impact and at the same time give you a good feel for the terrain. It features two-piece split core hub design for much easier maintenance. The sturdy construction of Phase Two still does come with some setbacks. It does not really fold at all, so if you are saving up on space, you might have some trouble storing it when not in use. Also, I found that the brakes have quite a bit of trouble functioning well when wet, so you may want to reconsider before riding out onto the pouring rain. Finally, since the tires are air filled with high pressure, they have the tendency to get punctured easily, especially if you are riding somewhere with sharp rocks or through a junkyard with hidden nails embedded in the ground. Whoever said scooters are just for little kids have never encountered the Xspec Freestyle yet. 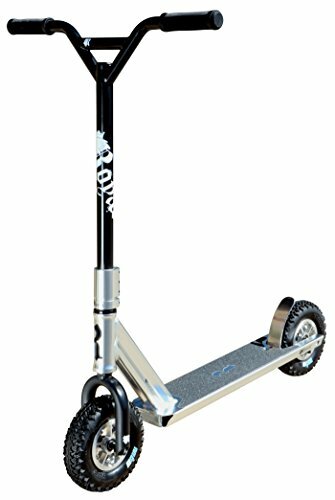 It is the perfect scooters if you are into shredding some at skate parks, or would just like to ride around town in paved roads, or through rough terrain like trails and even hills. It is built in such a way that it surpasses the normal kid scooters you normally see around the neighborhood so that it can handle a lot more ad you can do so much more with it. The oversized BMX-like handlebars are fit for bigger hands that need a better grip. It is made for comfort and maximum grip so that you get the feel of a true BMX in the palms of your hands as you drive this dirt scooter. 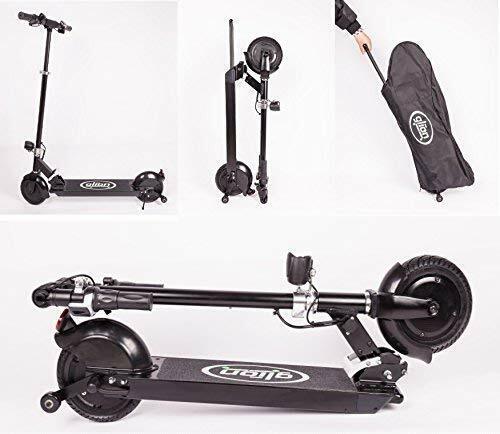 The handlebars are supported with a reinforced steel threaded alloy that provides durability, strength, and stability to make sure that you are in full control of your scooter whenever and wherever you may be. 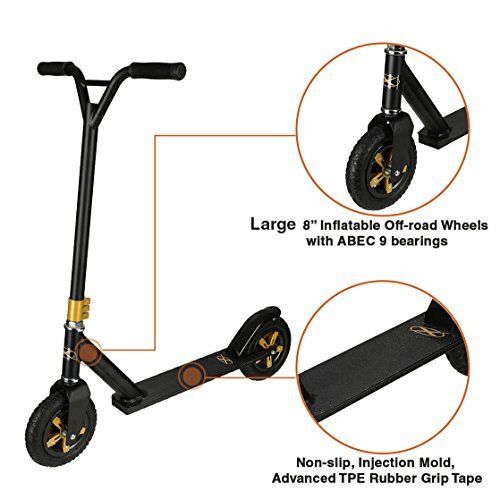 The back and gold or black and orange color scheme choices give you really cool choices that are super stylish and more business looking than the pain block colors that other dirt scooters provide. You will be the coolest dirt scooter in the park even just at a glance. The eight-inch inflatable wheels are specially made for off-road use so that it can withstand even the roughest terrain. It is the perfect set of wheels for shredding and off-road riding. The powerful fender brake is your trusty partner, and the fixed handlebar gives you optimum stability and control. To top it all off, its aluminum extrusion deck is coated with a unique rubber grip tape for maximum steadiness and an ultimate no-fail stance for your tricks and stunts. This is a hefty scooter if you are the type to go for lightweight rides. Although advertised as ten pounds, it actually weighs six pounds more. This could put you at a disadvantage if performing stunts and tricks because the added weight is significant enough to exhaust you after a few repeats, or may not allow you to execute as properly as if you were riding an actual ten-pound scooter. Every rider has that one scooter that they have always dreamed of. If riding is your life and you want every type of surface covered, the Royal Scout Pro lets you ride over anywhere and everywhere without having to worry about terrain, incline or obstacle. Whether skate park, BMX course, you have a trusty riding partner with the Scout Pro. Take it with you to trails, alleyways, and even mountains. You are not restricted to paved walkways and dainty parks with this dirt scooter. The aluminum material that comprises its deck and neck give it a rigid and sturdy construction that you will badly need during rough riding. It ensures that you get a durable material for your scooter that is unparalleled by any other material when it comes to combining sturdiness with lightness. 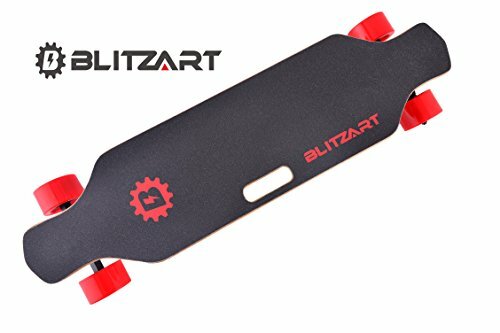 This can make any rider even more confident to do those stunts and tackle rougher terrain, knowing that you have one of the sturdiest scooters in town. If you were wondering what Chromoly forks have to offer, you would probably be glad to know that they take off as much as 1.4 pounds. Shaving off this amount of weight can have a significant impact on a rider’s performance, especially if you are dealing with difficult terrain, or are all for shredding and stunts. The extra weight taken off can give you more endurance and allow for easier control of the scooter. We have tested the Scout out, and it indeed was a well-built piece of work. It is durable, steady, lightweight, and the overall body and frame are all perfect. However, after some time of use, the wheels seem to produce an uncanny clicking sound. You may want to check if you need a change of tires for this unit as it may pose a safety issue, especially if you are riding on high trails or doing stunts. If you are buying for a child, try to consider the kid’s age. In relation to this, try to take into account how much he or she weighs of how big they are. There are weight indicators, and sometimes age ranges for each model that you can note. There are dirt scooters that are made especially for kids. These are usually smaller and lighter to make the scooter a lot easier to control for little riders. Aside from the weight of the rider, you should also take into consideration the weight of the scooter itself. Usually, the lighter the scooter, the better the ride. This is because lighter scooters are generally easier to ride and control. However, look out for light scooters that easily break and damage, especially when rough riding. 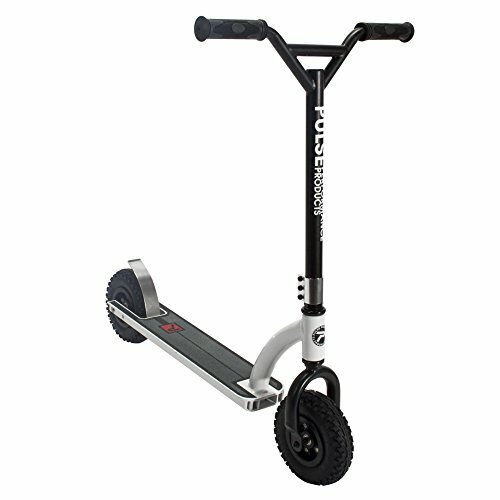 The higher end type of scooters is usually made of lighter materials that are still a lot stronger to be able to withstand off-road riding and give you a lot of durability and stability as well as control. The next thing you’ like to look at with dirt scooters are the wheels. The wheels are the determining factor that differentiates dirt scooters from regular ones since they are made to carry riders through rough terrain. Look for wheels that have aggressive patterns that offer greater traction to grip through those dirt paths and obstacles. These wheels should also be large enough to glide through obstacles like rocks and uneven terrain smoothly. Aside from the tires, another important factor to consider is the handlebars. If you expect to do a lot of rough riding with your scooter, the handlebars should be immovable. Foldable handles create weak points that may give way to shaking and rough handling. The proper height for comfort and control should be somewhere between mid-hip to waist. A larger grip is also much preferred, especially for older and bigger riders since this gives you more grip and therefore more control. If you plan to ride your dirt scooter on a smooth and even surface, chances are, you might find that it is a lot more difficult to do so than with a regular one that is because some dirt scooters are made for rough terrain only. However, you would be glad to know that many dirt scooters do a great job at crossing rough as well as paved roads. If you are not sure as to the type of terrain you will be tackling, it would be best to get the type of scooter that can function both on and off road. Finally, one of the most crucial things you can consider when buying a scooter is its cost. Understandably, the higher the cost, the more durable and lightweight a unit is, usually. But that does not necessarily mean that you need to buy the most expensive one at all cost. It will have to depend on how much you plan on using your dirt scooter, or how much you really need it. If it is just for occasional play, you might want to take a look at less costly ones that have all the basic features. However, if you are a pro rider, you may want to get the best of the best. There is not one best dirt scooter that is suitable for all riders. Each rider has his or her own preferences and specifications that are fit for their needs and their riding styles. It is best to look into each consideration when buying a dirt scooter and do thorough research on scooter brands that can provide you with the best type of scooter to match your needs. Some trusty brands give out scooters for all ages like the Razor Pro and Pulse Performance that accommodate young riders as well as seasoned ones. 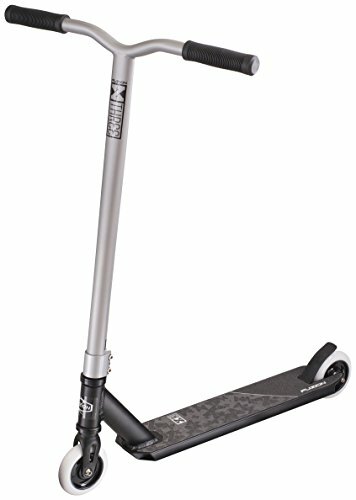 There are also brands that give you professional quality scooters that have been made for and sometimes even made by professional riders like the Phase Two, and the Xspect. 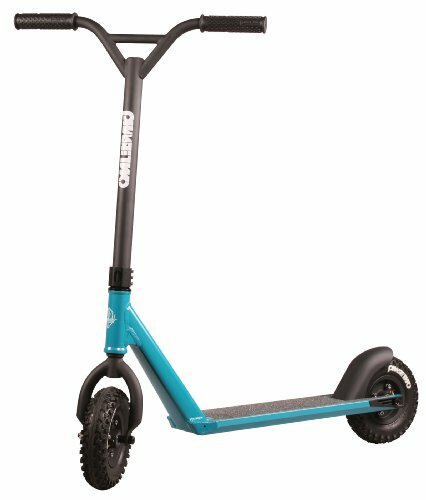 If you are trying to get a good ride that your child can enjoy with friends, or even ride to school without having to worry about bumpy paths he might encounter, the dirt scooter is probably the best choice. It is a whole lot easier to learn than the bike, easier to control, and with less risk of falling and getting hurt while riding. If you, as an adult, are into riding sports and stunts, a professional dirt scooter is also a great option. You can take it to the skate park, and even trekking for a great adventure. In the end, it is all but a matter of choosing a scooter based on your needs, on your comfort, and the level of control and performance you want to get from it. **Update: Dog Powered Dirt Scooter? these heavy duty tires make the scooter capable of handling almost any terrain including dirt and snow.